Figure 1. Soil map of the Ji-Parana´ River basin (EMBRAPA, 1983) (Ballester et al., 2003). Richey, Jeffrey E.; Victoria, Reynaldo Luiz; Aalto, Rolf Erhart; Abdo, Mara Silvia Aguiar; Alin, Simone Rebecca; Aufdenkampe, Anthony K.; Ballester, Maria Victoria Ramos; Bernardes, Marcelo Correa; Bolson, Marcos Alexandre; Bonelle, Nilton; Brito, David Silva; Cogo, Michelle Cristine; Cunha, Hillandia Brandao; Silva, Luis Vilmar Souza da; Deus, Fabiano Alves de; Devol, Allan H.; Ellis, Erin Elizabeth; Fernandes, Erick C.M. ; Ferro, Jaderson Coradi; Filho, Walter Jorge do Nascimento; Frickmann, Fernando Cruz; Guandique, Manuel Enrique Gamero; Gomes, Beatriz M.; Neto, Sergio Candido Gouveia; Hanada, Lais de Carvalho; Higuchi, Niro; Holtgrieve, Gordon William; Krusche, Alex V.; Leite, Nei Kavaguichi; Logsdon, Miles Grant; Macedo, Gelson de; Marcondes, Renata; McGeoch, Lauren; Moreira, Marcelo Zacharias; Neu, Vania; Ometto, Jean Pierre H.B. ; Pimentel, Tania Pena; Filho, Nicolau Priante; Rasera, Maria de Fatima Fernandes Lamy; Remington, Sonya Marie; Rodda, Sarah; Salimon, Cleber Ibraim; Santiago, Alailson Venceslau; Toledo, Andre Marcondes Andrade; Tumang, Cristiane Azevedo and Victoria, Daniel de Castro . You may contact Ballester, Maria Victoria Ramos (vicky@cena.usp.br). This data set provides a digital map of soil orders for the Ji-Parana River Basin, in the state of Rondonia, Brazil (Western Amazonia). Soil orders were manually digitized from a 1:500,000 map from EMBRAPA originally published in 1983. Oxisols and Ultisols are the predominant soil types in the basin, encompassing 47% and 24% of the total drainage area, respectively. Entisols cover 14%, Alfisols 13% and Eptisols 2% of the basin (Ballester et al., 2003). There is one ESRI ArcGIS shapefile of soil order boundaries with this data set. The shapefile (soils. *) contains six files (*.shx, *.dbf, *.prj, *.sbn,*.sbx, and *.shp). Note: The Brazilian soil classification system does not map one to one with the U.S. classification system. SoilOrder has U.S. soil order classification values. Unidade (Unit) has Brazilian classification values that are a combination of order and suborder. By retaining Brazilian classification values we avoid losing some information. Temporal Resolution: One time occurrence. Ballester et al. 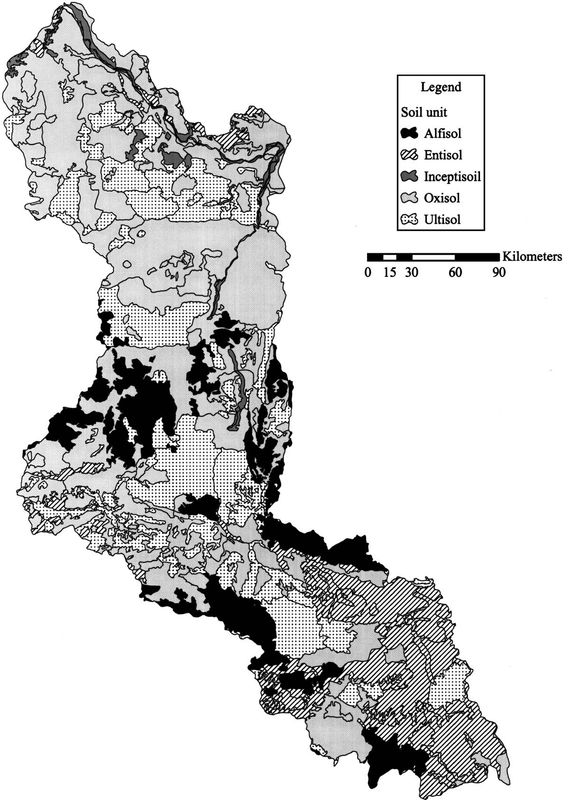 (2003) used this soil map in their integrated analysis of the landscape characteristics, including soil properties, river network, topography, and land use/cover of the Ji-Parana River basin. Soil units were derived from four EMBRAPA (1983) 1:500,000 maps, manually digitized. The average mean square error was 1.2 m.
In the State of Rondonia, Brazil, (Western Amazonia), the confluence of the Comemoracao and Pimenta Bueno Rivers results in the Ji-Parana River, which also receives water from the Rolim de Moura, Urupa, Jaru, Machadinho and Preto tributaries. The Ji-Parana River Basin drains an area of 75,000 km2, and is characterized by extensive development in the upper part, and slight alteration in the lower 400 km. From headwaters to its middle sectors, the river is highly impacted, with a predominance of pastures and agriculture. About 60% of the soils in the basin are eutrofic and are favorable for agriculture. Oxisols and Ultisols are the predominant soil types in the basin, encompassing 47% and 24% of the total drainage area, respectively. Entisols cover 14%, Alfisols 13% and Eptisols 2% of the basin (Ballester et al., 2003). Soil orders were digitized from 1:500,000 maps from EMBRAPA originally published in 1983. Four paper maps were manually digitized in ArcInfo GIS and projected in UTM coordinate system. The average mean square error was 1.2 m.
Ballester, M.V.R., D. de C. Victoria, A.V. Krusche, R. Coburn, R.L. Victoria, J.E. Richey, M.G. Logsdon, E. Mayorga, and E. Matricardi. 2003. A remote sensing/GIS-based physical template to understand the biogeochemistry of the Ji-Parana river basin (Western Amazonia). Remote Sensing of Environment 87(4):429-445. Cochrane, T. T. and Cochrane, T.A. 1998. SIGTERON, Sistema de Information Geografica para os terrenos e solos do Estado de Rondonia, Brasil. (Geographic Information System for terrains and soils of Rondonia State, Brazila) Tecnosolo / DHV Consultants BV, Porto Velho, Rondonia. Portuguese.